In recent weeks Lake Michigan turned over, which cools the water down on the lake and signals to the salmon it’s time to head upriver. For the last few weeks we’ve found some good salmon fishing in Western Michigan’s tributaries. On the other hand, it’s been sort of a goofy year because salmon hung in the river mouths for longer than they normally do because the water in our Western Michigan rivers was too warm. Right now, there’s salmon everywhere. 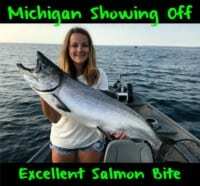 Salmon are running from the Muskegon/Newaygo area to Manistee/Wellston. There’s salmon from the mouth of the rivers to the dams. Many of the salmon left Lake Michigan and headed upriver with the rain we got about a week ago. The salmon know it’s time to spawn. Meanwhile, river water temperatures aren’t cooperating. Normally, salmon will spread throughout the system. Unfortunately, the warm water has them flying upstream to get to their spawning areas. On a positive note this year’s crop of fall salmon are large. I mean huge. We’ve had fish to fish 30 pounds. 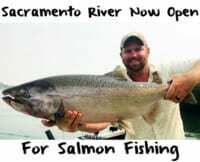 The average size in the river is 18-20 pounds. At this point most Western Michigan rivers have a good run of salmon. On the other hand, for the lower end of the rivers I think we are past the biggest part of the run. However, there’s still plenty of good salmon fishing to be had in the upper stretches of most rivers. Basically we’ve been catching most fish on pink and red Fire Cured skein. One thing I’ve been doing often this year is sprinkling Fire Power (krill powder) on to my eggs during the curing process. It’s also important to downsize. Boat traffic has been horrendous on the lower end of the river and these fish are spooked. Downsizing considerably has produced because there’s a lot of pressure. There are 9,000 people throwing hardware at them. I’ve never seen crowds like this. To avoid crowds I’d go into the upper stretches of the rivers. Those fish will still bite skein up there. And, keep in mind, you don’t have to fish for the salmon you can see on spawning gravel. My school of thought is if you can see salmon don’t bother fishing them because they aren’t going to bite. I want to go find the deeper, darkest water I can, avoid the spawning fish and downsize. Remember these salmon are in the deepest holes. I can’t stress the importance of downsizing. 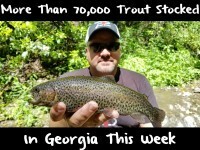 We’ve been dropping down to 8-10 pound fluorocarbon and almost steelhead size skein and spawn bags. Editor’s Note: Pautzke pro Kyle Buck operates Great Lakes Guide Service on Lake Michigan’s western shore. For more info on his guide service please visit http://www.greatlakesguideservice.com/.